Elroy Chavez Copper Bracelet with Stamped Sterling Inset size 6 1/4"
Elroy Chavez has recently been making stamped bracelets of copper and bracelets of copper with an inset strip of stamped Sterling. 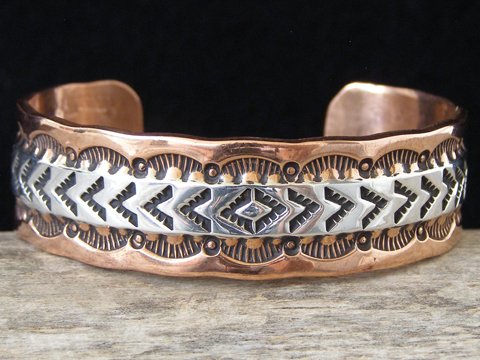 This is great traditional Navajo stampwork in combination with copper which makes for a great price. Uniform width of cuff: 3/4"
Stamped Sterling inset: 3 3/8" x 1/4"
Terminal to terminal: 5 1/4"
Total inside circumference (including gap): 6 1/4"